I walked up to find the quiet area was a temporary cemetery. 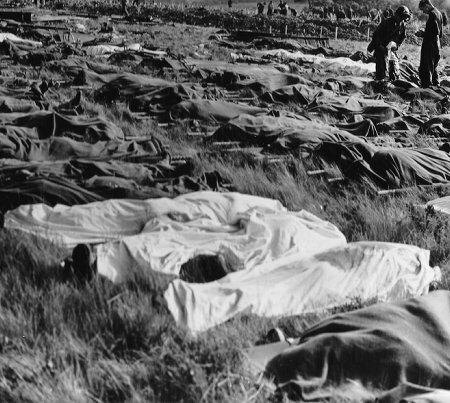 Poncho covered bodies laid in neat rows. A crude signpost at the far end of each row I guessed must categorize the men there by unit. I could make out a small team of men unloading an assortment of vehicles at the far corner. The vehicles were lined up almost back into the town, each bringing over bodies that had come down the mountain or been discharged from a medical station. I walked between the rows to where the team was working. Looking closer it was clear that some of the old ponchos on the ground covered only a portion of a human body. There were five men working the yard, rotating who was off as pairs of them carried each new case. They had a few stained stretchers to use. I offered my services to the chief NCO there, to make it an even six men working. Staff Sergeant Bill Allen looked me over for a few seconds, unsure if I was serious I suppose. Few men volunteer for the job, even the drivers who bring over several corpses at once. I was paired with a young Army corporal and we got busy clearing their backlog. Footing was tricky in some spots, the day’s rain putting wet rocks or slick mud under foot, and making them hard to tell apart. Corporal Warner Thompson hails from Fairfax, Virginia. Most of his infantry unit is doing back-line jobs like this one. Their part of the 5th Cavalry was hit hard and probably won’t do much until it can get off the island to rebuild. We talked about his experiences in the fight, and about life back home, and pretty much everything except what we were doing. Finally he broached the subject, by way of a standard soldier’s gripe about getting a lousy job. I asked how long he’d been at it. “This is the third day. 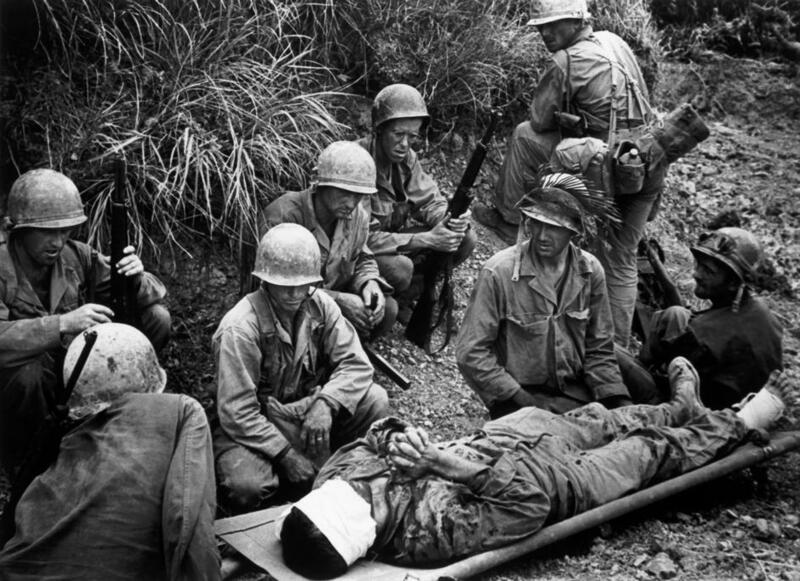 They had us stack ‘em here almost right from the start.” Getting ambulances back and ammo forward took priority on the narrow road. 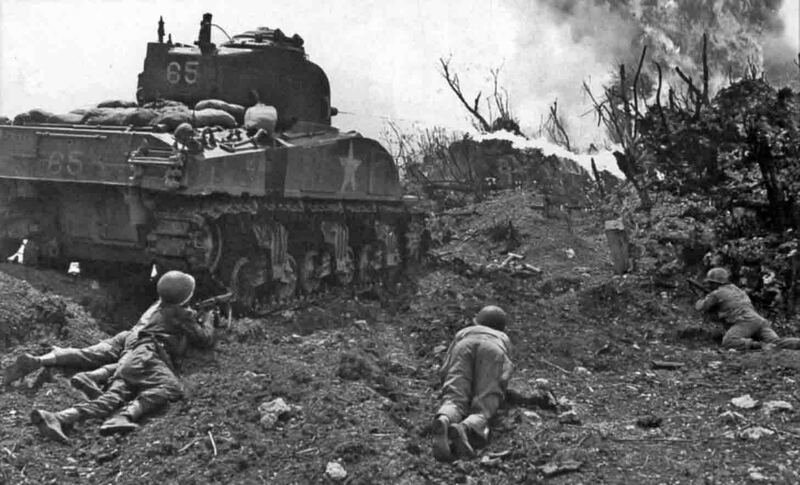 Happy V-E Day, or as the men on Okinawa called it, “Job Ain’t Half Done Day!” Actually, most of them didn’t call it anything. They were a little busy, and couldn’t see past tomorrow, let alone through to the end of all the fighting ahead.